When it comes to using social networking tools to market yourself, your career or your business, each Personality Pattern has different strengths and weaknesses. 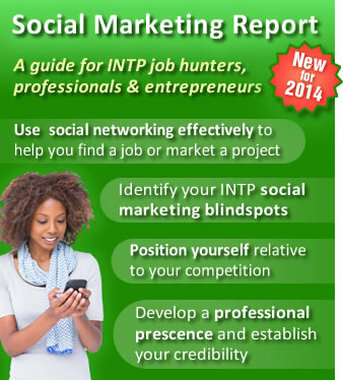 INTP's social marketing strengths and weaknesses are listed below, together with practical actions to help you make the most of the tools available. 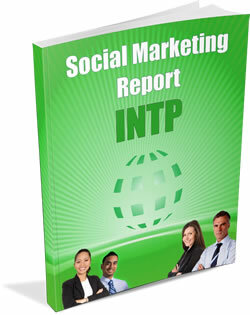 ﻿The extract above gives you a taste of the complete INTP Social Marketing Report, a must-have guide for job hunters, professionals and entrepreneurs. It's available for only $6.00 via the Buy Now button on the right. Unlike conventional self-help books, the INTP Career Fulfillment Guide is written specifically for your personality type, and comes complete with tailored guidance on your key strengths in the workplace; typical career choices for your type; how to market yourself in today's competitive environment; your learning style; and self-development exercises culled from Applied Psychology. INTP is short for Introvert, iNtuitive, Thinking, Perceiving - terms used in the Myers-Briggs Type Indicator (M.B.T.I.®) to show your preferences. M.B.T.I.® is used across the world in recruitment and team building.